National Achievement Survey NAS School List Std – 3,5,8: National Achievement Survey released Gujarat School list for standard- 3,5 & 8. Teachers may check National Achievement Survey NAS School List Std – 3,5,8. Here we also provide all information about National Achievement Survey on this page. Primaryguru.com is Educational blogger website. Here we daily update Government education information, Primary and Secondary GR and Notification, Competitive exam Materials, Call Letter / Hall Ticket, Answer key, Result, OMR SHEET, TET/TAT/HTAT exam information and materials, CCC exam Call Letter / Hall Ticket, Result. We Provide Useful links for Apply Online, Get Instant Result, Print Call Letter / Hall Ticket, Answer key, OMR SHEET. Our aim is provide complete information related above mentioned topics to our visitors. We always try to provide a correct and fastest information to our visitors. You may also Subscribe your mail address to get important information daily and weekly about we mention above. 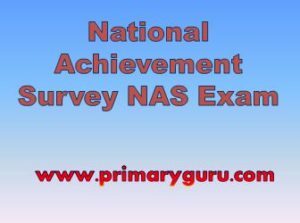 Candidates are advise to bookmarks this page and be regular touch on this page for get more latest updates about National Achievement Survey NAS School List Std – 3,5,8.